Posted on Thu, Jan 12, 2012 : 3:11 p.m. 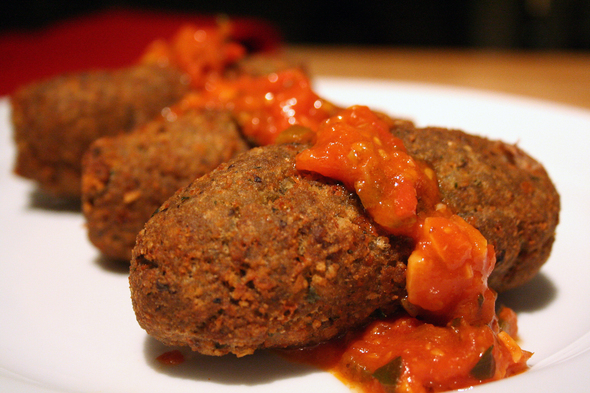 This easy eggplant "meatball" appetizer recipe is from the Calabria region of Italy. Last November, The New York Times ran a piece with the title "Are Cookbooks Obsolete?" Thanks to new and exciting iPad apps, the Times is predicting that the days of cooking from a splattered and stained cookbook page may soon be over. Now you have to understand that this is coming from a woman who still owns many thousands of compact discs and vinyl records, but I am far from ready to give up my own cookbook addiction. In fact, after the obligatory first stop in the kids' book area, you can usually find me haunting the cookbook section of any bookstore. A recent bookstore visit yielded my first cookbook purchase of the new year: a heavy tome put out by the Academia Barilla called "Italian Cuisine" that was languishing in the remainders section. The photos are gorgeous, and the recipes are a step beyond the standard Olive Garden-type fare you often find in remaindered cookbooks. The only potential downside of this cookbook is that it is obviously translated from Italian, so the instructions can occasionally be a bit bewildering, and the word order is sometimes jumbled. On the plus side, it's fun to read the recipes out loud with an Italian accent. My first favorite recipe from this new cookbook is an easy eggplant appetizer. Originating in the Calabria region in Italy, polpette di melanzane are tasty meatless "meatballs" made with eggplant, cheese and breadcrumbs. Their texture and flavor make them a pretty convincing meatball substitute; they are a great way to get picky kids to eat eggplant. I recently purchased a very small countertop deep fryer, so this recipe was perfect for inaugurating it. If you’re using a deep fryer with a temperature gauge, set it to 350 degrees. Otherwise, heat the oil up in a deep skillet or medium-wide saucepan until it's very hot but not smoking. If you’re up to temperature, the oil around the meatballs should immediately start to bubble once you've carefully lowered them into the oil. Polpette di Melanzane (Eggplant "meatballs") adapted from "Italian Cuisine"
Wash the eggplant(s), cut them in half (or quarters if you’re using one large eggplant), put into a pot and cover with water. Bring to a boil and leave to cook, uncovered, for about 45 minutes. Drain the eggplant and leave to cool. Meanwhile, prepare the breadcrumb mix. Combine the breadcrumbs with chopped garlic, parsley, grated cheese and salt and pepper to taste. Squeeze out the excess liquid from the eggplants. I mashed them into a sieve to accomplish this. It’s a little messy; so make sure to do it over the sink. Mash the eggplant with the breadcrumb mixture and the egg, combining everything so as to obtain a uniform mixture. Divide the mixture into 4 equal parts and roll each part into elongated, fairly flat “meatball” and fry them in oil that’s been heated to approximately 350 degrees for 4-5 minutes, or until evenly browned. You can do this in a deep fryer if you have one, or in a deep saucepan with about 3 inches of oil — enough to cover the "meatballs" while they fry. These may be served hot or cold, and are delicious with a spicy tomato dipping sauce. Heat the oil over medium high heat in a medium skillet. Add the garlic and cook for 1 minute, stirring almost constantly to avoid burning the garlic. Add the minced jalapeno pepper, pepper flakes, parsley and some freshly ground black pepper and sauté for an additional two minutes. Then add the halved tomatoes and cook for 3-4 minutes, stirring occasionally, until the tomato skins start to blister a bit. Add the white wine and simmer over medium-low heat for another 10-12 minutes. Add salt to taste. A few quick pulses in the blender or food processor, or a minute with an immersion blender will make the sauce nice and smooth and perfect for dipping. Jessica Webster leads the Food & Drink section for the AnnArbor.com community team. You can reach her at jessicawebster@annarbor.com. Fri, Jan 13, 2012 : 6 p.m.
looks like a treat, as soon as i drop the kids off at the pool. Fri, Jan 13, 2012 : 2:39 a.m.
Fri, Jan 13, 2012 : 2:26 a.m. This recipe sounds delicious, though I wonder if, with the addition of a bit of oil to the meatball recipe, these might not be able to be baked rather than fried - easier and probably healthier as well. I might give them a try, but likely would simply use them as a tasty vegetarian alternative to regular meatballs. Thanks for publishing this! Thu, Jan 12, 2012 : 8:40 p.m.
is that what that's supposed to be?